It is your responsibility to ensure that all members of your party accept the terms of this contract as set out below. Failure to disclose all relevant information or comply with these terms may lead to termination of the contract and loss of booking. To confirm the reservation for your holiday, the confirmation / booking form must be returned with a deposit of £200 per week, this deposit is non-refundable. The balance should be paid 4 weeks before your holiday. Once a booking is confirmed the Hirer is responsible for the total cost of the holiday. ‘Total’ meaning both Deposit and Balance payments. In the event of cancellation by the Hirer, Owner will endeavour to re-let the property, and if successful will refund any monies paid less the deposit, which is non-returnable. In the event of a major breakage such as a window or piece of furniture we would expect the hirer to cover the cost of replacement. Please ensure that you have adequate holiday insurance for cancellation, accidents, hospitalisation and return of yourselves and vehicles to your home address. We cannot be held responsible for any accidents break-ins or theft within the property during your stay. We cannot accept liability for any injury, loss or damage, consequential or otherwise suffered by you or any other member of your party, unless there was wilful default by us, or unless personal injury or death was caused by our negligence. At the Old Oil House Boscastle we aim to make life easy thats why we include electricity, cleaning and bed linen for 6 people as part of the booking fee. Smoking is forbidden in The Old Oil House. Hirer agrees to allow reasonable access to the property by the Owner or representatives. The Old Oil House will be available to you from 3.00pm on the first day of rental and we ask that you vacate by 10.30am on the last day of rental to enable cleaning for following guests. One well behaved dog is welcome although we do ask they are kept off the furniture. 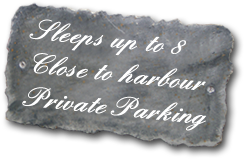 There is one allocated parking space outside the Old Oil House, if additional parking is required there is a large car park 3 minutes walk away from the cottage and this is free after 5pm (please check the terms). Please be aware that we are unable to rope off the parking space and cannot guarantee that an opportunist won't park there due to it's convenience to the local shops. Therefore although the parking space is allocated for this property, we cannot be held responsible if it is not available for any period. If in the opinion of the Owner of the property, any person is not suitable to continue their occupation of the property because of unreasonable behaviour, damage or nuisance to other parties, the contract may be discharged and the Owner may repossess the property immediately. The Hirer will remain liable for the whole cost of the rental and no refund will be issued. We offer The Old Oil House as a holiday home for you and ask that you take care that the peace and tranquillity of the neighbourhood is not disturbed. Please be aware of and respect immediate neighbours.